Leave it to my cousin to feel hotter than preggy me... he insisted we go swimming last Saturday and we ended up at El Madero Farm & Resort located at Bagong Pook in Lipa City (Batangas). El Madero was one of the nearer resorts to our parents' homes so we opted to go there, thinking that if we forgot something vital, we could easily go back home for it. We also opted not to get a room anymore as we didn't really have any funds. We were just hot and the bigger kids just went swimming for some three hours. That is from 10 PM to 1 AM. Haha. We also didn't get to take lots of good pictures of the place since we arrived there at night and we only really enjoyed the big kiddie pool, with water only two feet high. 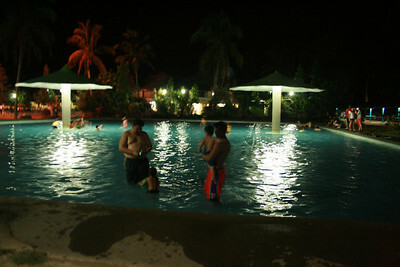 It's a big, big pool for kids to play in and it suited us as we had two year olds with us. Weirdly enough, the water wasn't cold despite the cold night air. Even my son got to swim till past 12 AM. One other good thing about El Madero Farm & Resort is that it's near a lot of places where you can buy food and drinks, and there is no corkage for food you're bringing in the resort. For other pictures and rates, better check out El Madero's website at el-madero.net. They also offer villas with private pools and the place is so huge, it's great for events and parties and weddings.